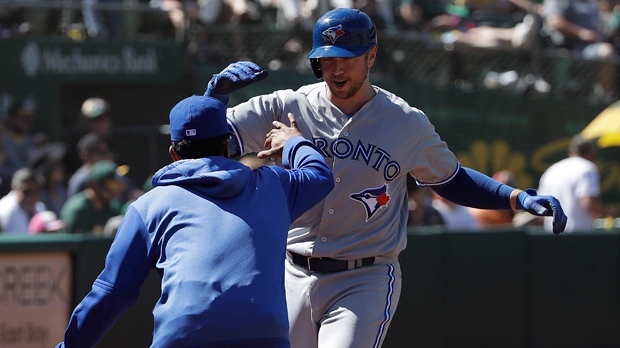 Justin Smoak got thrown out on a wild sequence that began with another sensational play by Oakland centre fielder Ramon Laureano, but wound up with four hits as the Toronto Blue Jays beat the Athletics 5-4 Sunday for a three-game sweep. 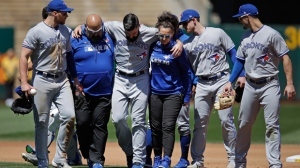 Toronto Blue Jays starter Matt Shoemaker had to be helped off the field after injuring his left knee during a rundown in the third inning Saturday against the Oakland Athletics. The Blue Jays prepare for the 2014 regular season with spring training in sunny Florida. The boys of summer are back, and took on the Cleveland Indians for their home-opener in front of 50,000 at the Rogers Centre. These fans dressed up in their Blue Jays best to show their team spirit ahead of the home opener.